One of the things that interested me about the Sebald film I saw last week was the mapping and the way that one of the researchers was plotting the Sebald walk on something that looked a lot like Google Maps. I liked the idea, and had already been toying around with the idea of mapping some of my poems and where they are set; a bit like the way Instagram is now mapping photos you upload. In my looking around I can see there are quite a few projects that are into mapping literary places: for tourists who want to walk the walks of Wordsworth (like I do! ), for historians, for students and teachers and just for the fans. One interesting one is Google Lit Trips, a nice tool for teaching some literature. One of the things I like to do, when I have some time to myself, is to walk along the beach. Sometimes poems come, other times I take photographs or just enjoy the light. Yesterday, when taking some short videos, I came across a lost object near the shore in the water. A yellow flipper. It wasn’t a watch, but I was reminded of an early poem of mine, “Lost Things”, partly about finding lost things at the bottom of the sea. “These lost things still exist”. You can find that poem on my website or you can see the yellow flipper in this short video. Or do both! Maybe there’s a new poem in this too. Last week my new favourite fancy microphone I bought myself for Christmas came in handy when I recorded some postcard poems for the Varuna Writer-a-Day Project. I recorded some poems for the project and they’ve gone online this week. I spent some time just prior to my first book coming out and I was intoxicated by the physical and mental space of a couple of weeks just to write! I met some great people and made real progress on the manuscript, but also was inspired enough by the Blue Mountain landscape to write some postcard style pieces, some of which were published in the now defunct Bluey magazine. It was good to look at these pieces again and record them for a new audience. My Blue Mountainalia poems are HERE on the Varuna blog. Words and audio! 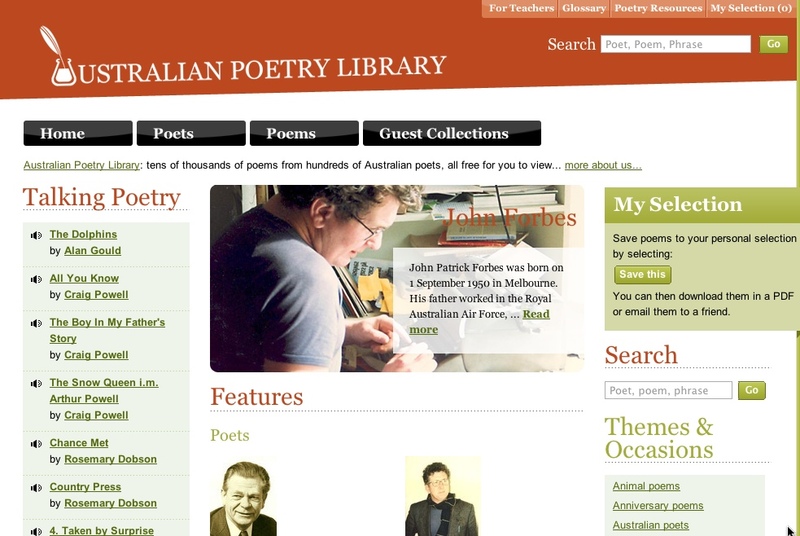 The Australian Poetry Library is a nice idea; in fact, I’ve got a feeling I may have invented this myself and presented the ideas at the Sydney Poetry Festival a few years ago. Anyway, the idea of accessing some contemporary Australian poetry from a central portal, particularly for English teachers wanting to work with these poems with students, is essentially good. And that does seem to be the focus of this site, perhaps along with the general reader looking for a good Australian poem about happiness, for example. However, this version has caused some controversy with some poets (like Laurie Duggan) not happy with how it’s rolled out and the communication around all that. Fair enough too, and I’m not all that impressed with the range and the green curtains either. But it’s a great start, and in the tradition of the Academy of American Poets. That’s something to build towards! It’s taken the long weekend to finally find time to have a first look at the new Australian Poetry website, but I have now and it looks good. I like the layout and it’s very newsy and is trying to incorporate some social tools including groups, friend requests and more. All very nicely integrated. They’ve even got a twitter feed, integration with Facebook and an Iphone app. Its chunky at 60MB and $3.99 but has a lot of information on Australian poets and poetry-related activity happening in Australia. I even got a friend request from Admin to welcome me! Nice. It will be good to see how this develops. 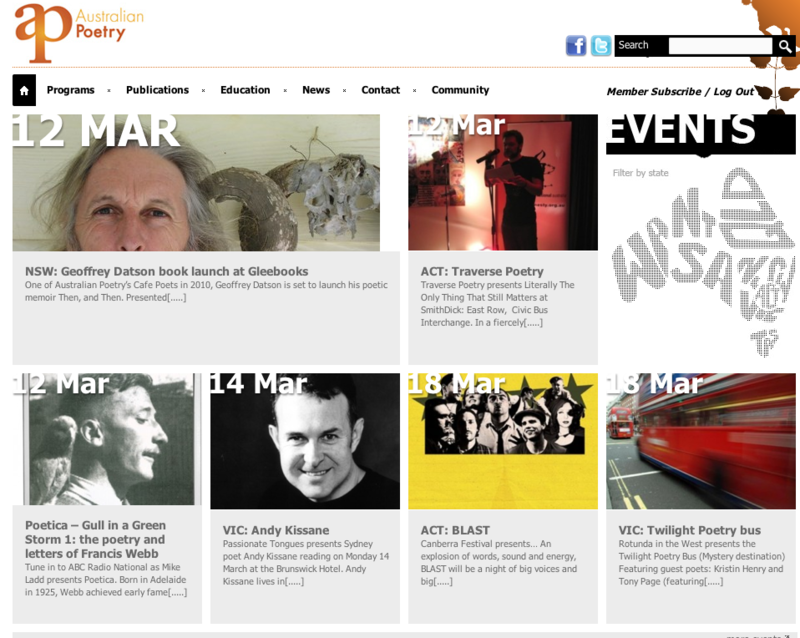 Australian Poetry Ltd is a merger between the Australian Poetry Centre based in Melbourne and Poets’ Union based in NSW. It aims to be the new peak body for poetry in Australia with a charter to promote and support Australian poets and poetry. It’s certainly in a better state than the old Fellowship of Australian Writers, which looks a bit tired in its website. I was a member of the FAW for a long time, and did my first public reading of a poem of my own at the Manly (NSW) branch one evening. I was so nervous and I read a piece called Two Maggies. Everyone was very polite. So I’ve got good memories of that organisation and the work they do. It was established in the 1920s, but it does seem to be struggling a bit at the moment. As you will know from previous correspondence, the Poets Union and the Australian Poetry Centre are to merge at the end of the year to create a new, truly national poetry body, Australian Poetry Limited. This merger is supported by the Literature Board of the Australia Council, Arts NSW and Arts Victoria. For the first time poetry will receive a more sustainable commitment from Arts funding bodies in order to provide a professional service to members, support poetry groups and have a greater influence on the reception (and promotion) of poetry nationwide. Australian Poetry will have an office in Melbourne and Sydney in 2011, with a brief to include all cities, states and territories in projects and opportunities. The purpose of this newsletter is to let you know about the arrangements and the effect they will have on your current membership of the PU or APC. Australian Poetry will be governed by a National Board. The members of the current Board are: Chris Wallace-Crabbe (Chair), Anna Kerdijk-Nicholson (Secretary), Nell White, Marcus Powe, David Musgrave, Margaret Bradstock and Martin Langford. The Board will be responsible for the strategic direction of the organisation and advising the National Director in regard to all future plans for Australian Poetry. A National Director will report to the Board and have responsibility for the artistic program, working with a team initially based in Victoria and NSW to deliver an exciting national education, events and publications program, including the publication of high quality poetry journal. A National Advisory Council will be made up of leading poets and representatives of key poetry organisations to advise the Board and National Director in regard to the program and strategic direction of the organisation. Following national advertising and interviews, Paul Kooperman has been appointed National Director of the organisation. Australian Poetry is currently advertising for a Publications Manager and other positions will soon be advertised for including a NSW Director and National Administrative Officer. Please watch the websites for these advertisements. You will be advised of these appointments as they are made. The NSW Director will be responsible for the delivery of the national program in NSW and for initiating specific NSW projects. It is anticipated that there will be a need for a volunteer committee to assist the NSW Director. The exact nature and function of this committee will be advised following the appointment of the NSW Director. Current APC members will be invited to roll their membership on into the new organisation without having to pay extra joining fees. Current Poets Union financial members will automatically become members of the new organisation and receive free membership until June 30th 2011, at which time you will receive renewal notices. From then on membership will date from time of joining. Membership fees have not been finalised. They will be slightly higher than a single membership of either organisation but cheaper than being a member of both organisations. They will offer more for your money than comparable organisations. The next newsletter will provide the fee structure. We will be posting another newsletter later in the year which will advise you of the formal procedures for winding up the PU and APC. At this time we should be able to announce all appointments. In the meantime, please keep your eye on our respective websites for interim information. These answers expand on the information contained in this newsletter.